A wedding engagement party is usually a less formal event than the wedding celebration. A memorable event that marks the very early stages of exciting wedding planning your have ahead of you. So congratulations to you both! Having a pre-wedding party also gives you both the opportunity to invite people from work and very close friends and even their children  that may not be attending the wedding. This could be due to a limited budget or friends that may not be able to attend your wedding. Your pre-wedding party is also a great way to celebrate the wonderful news of becoming newly engaged with all your loved ones. It's an exciting time to show off your amazing engagement ring and for all your beloved family and friends to really get to know each other and the both of you. If you're planning on celebrating your engagement, you'll need to know about engagement party protocol and the rules of engagement. You'll also need to become familiar with effective wedding engagement planning, engagement etiquette  do's and don'ts, the propriety of giving engagement gifts, the party invites, engagement invitation wording and who should be invited. A Champagne Toast to the Engaged Couple. Firstly a guide on how to announce your engagement to family, friends and the world at large, with appropriate engagement annoucement etiquette. 2. Who's Hosting the Party? When it comes to hosting the engagement party  the party can be hosted by the brides parents, the grooms parents, close relatives or a very special best friend. However, it is more commonly hosted by the parents. One of the parents, usually the father of the bride or groom makes the first speech. Followed by the engagement toast to the happy couple. The next speech can be made by the groom-to-be. He then makes a speech to his finance, followed by a toast to her. NOTE; It's proper etiquette to buy a thank card and gift for the person that is hosting your party. Fairy Godmother note; Regarding the matter of either parents hosting the party, some wedding books on etiquette say that the first celebratory event is hosted by the grooms parents. And the actually wedding reception is paid by the brides family. But which ever family is hosting the pre-wedding party, it is always wise for both families to discuss this with each other so there's a full understanding of who pays for what. Engagement invitation wording is very similar to wedding invitations. The difference's are how the invitations are worded and whether the engagement invite is going to be formal, semi-formal or casual. If you've already decided on a wedding theme, you can follow this through to your engagement invites. It gives your guests a glimpse of what's to come leading up to your wedding. However, if the theme had not yet been decided just stick to a classic invite  you can't go wrong. Here are some wedding engagement party invitation wording examples to get you started. Different invitation wording examples depending on who is hosting the party. 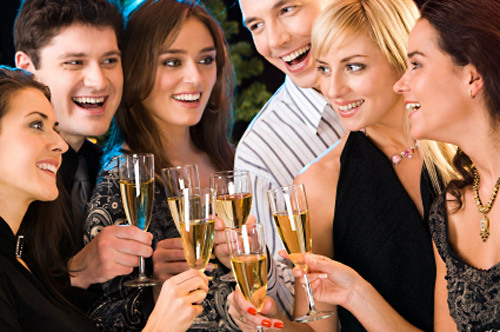 The most common engagement celebrations resemble a more casual setting of some sort or a casual or dressy coctail party with family, relatives and best friends. Engagement parties can be as casual as a backyard barbecue catering for a handful of people, an elaborate cocktail party with all the trimmings; bubbly champagne, fancy finger food like hors d'oeuvres and canapés, a buffet or an à la carte restaurant setting for immediate family members and your bridal party or even a formal reception hall with a set-course menu for all your guests. Whatever your party-plans are, it really does all come down to your budget and how much money you are prepared to spend on pre-wedding celebrations. Engagement party etiquette will vary from country to country and of course according to your wedding customs. However, there is a standard of engagement etiquette that serves most engagement celebrations and it's just as simple as following simple common courtesy in the quest of propriety  whom to invite, engagement gift etiquette, the timing of your event, how soon is the engagement celebration before the wedding ceremony and so-on. All this needs to be taken into account. A wedding engagement celebration is usually a less formal event than a wedding, however, I do remember having attended a very eleborate Italian engagement party that could have been mistaken for a wedding. It had all the trimmings of an expensive formal wedding reception, including a beautiful white dress. Of course, the choice is all yours. Traditionally, the engagement party toast is the preserve of the father of the bride (or groom) and the first toast is begun by him or if he `unaccustomed to public speaking' or altogether absent, then the first toast for engagement may be conducted by any family member or special friend. I have been to an engagement where the father of the groom conducted the wedding engagement toast without incident. Although gifts are not expected at an engagement celebration, some of your guests may still insist on bringing congratulatory gifts. In such cases, it is perfectly proper etiquette to unwrap the gifts the very next day. Be sure to send them thank you cards (don't forget).